A scientist from the Max Planck Institute discovered that von Economo neuron (VEN) is also found in the insula of macaque monkeys. This discovery may lead to new research opportunities that will examine the connections and functions of a cell and brain region that could have a key role in human self-awareness and in mental disorders including autism and specific forms of dementia. The anterior insular cortex is a small brain region that plays a crucial role in human self-awareness and in related neuropsychiatric disorders. 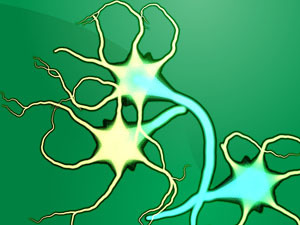 A unique cell type – the von Economo neuron (VEN) – is located there. For a long time, the VEN was assumed to be unique to humans, great apes, whales and elephants. Henry Evrard, neuroanatomist at the Max Planck Institute for Biological Cybernetics in Tübingen, Germany, now discovered that the VEN occurs also in the insula of macaque monkeys. The morphology, size and distribution of the monkey VEN suggest that it is at least a primal anatomical homolog of the human VEN. This finding offers new and much-needed opportunities to examine in detail the connections and functions of a cell and brain region that could have a key role in human self-awareness and in mental disorders including autism and specific forms of dementia. The insular cortex, or simply insula, is a hidden cortical region folded and tucked away deep in the brain – an island within the cortex. Within the last decade, the insula has emerged from darkness as having a key role in diverse functions usually linked to our internal bodily states, to our emotions, to our self-awareness, and to our social interactions. The very anterior part of the insula in particular is where humans consciously sense subjective emotions, such as love, hate, resentment, self-confidence or embarrassment. In relation to these feelings, the anterior insula is involved in various psychopathologies. Damage of the insula leads to apathy, and to the inability to tell what feelings we or our conversational partner experience. These inabilities and alteration of the insula are also encountered in autism and other highly detrimental neuropsychiatric disorders including the behavioral variant of frontotemporal dementia (bvFTD). The von Economo neuron (VEN) occurs almost exclusively in the anterior insula and anterior cingulate cortex. Until recently it was believed that the VEN is only present in humans, great apes and some large-brained mammals with complex social behaviour such as whales and elephants. In contrast to the typical neighboring pyramidal neuron that is present in all mammals and all brain regions, the VEN has a peculiar spindle shape and is about three times as large. Their numeral density is selectively altered in autism and bvFTD. Henry Evrard and his team, at the Max Planck Institute for Biological Cybernetics in Tübingen now discovered VENs in the anterior insula in macaque monkeys. His present work provides compelling evidence that monkeys possess at least a primitive form of the human VEN although they do not have the ability to recognize themselves in a mirror, a behavioral hallmark of self-awareness. “This means, other than previously believed, that highly concentrated VEN populations are not an exclusivity of hominids, but also occurs in other primate species”, explains Henry Evrard. “The VEN phylogeny needs to be reexamined. Most importantly, the very much-needed analysis of the connections and physiology of these specific neurons is now possible.” Knowing the functions of the VEN and its connections to other regions of the brain in monkeys could give us clues on the evolution of the anatomical substrate of self-awareness in humans and may help us in better understanding serious neuropsychiatric disabilities including autism, or even addictions such as to drugs or smoking. Be the first to comment on "Von Economo Neuron Discovered in the Insula of Macaque Monkeys"